Why is fried food so delicious? I wish there was a healthier alternative to this, but there is just no denying myself of fried crispy deliciousness once in a while! I was at the supermarket the other day and saw these cute little zucchini and though immediately of the fried zucchini I made over the summer with my overabundance of zucchini from the garden. I decided to change up the recipe a bit and was very pleased with the result! I love the crispiness of panko breadcrumbs and thought that would be the perfect coating for my zucchini, and then the thought of parmesan cheese came to mind also…yummy. I then started laughing because I had recently seen Giada from the Food Network make these, duh and realized that I didn’t think this treat up, but had just seen it get made. Well I’m glad I tried it out because the zucchini turned out perfectly crisp all over and just tender to the bite. I loved the look of the “fries” also; I will definitely keep this one in the back of my mind for summer! Heat 2 inches of oil in heavy pot to 350 degrees while preparing zucchini. Cut Zucchini into ½ inch thick spears. Beat eggs with 1 teaspoon salt & pepper and set aside. Combine panko flakes and parmesan cheese and set aside. Lightly coat zucchini with flour and shake off any excess, dip into egg mixture and then into panko/cheese mixture, press to ensure coating sticks to the zucchini. Fry zucchini a few at a time for a couple minutes, until deep golden brown. Remove to paper towel-lined plate and sprinkle lightly with salt, serve immediately. These are delicious served alone, or with a marinara or blue cheese dressing for dipping. Anything coated with parmesan and panko, and fried, would appeal to me! These look delicious, and I love your creative plating. Oh gawd, these look awesome! 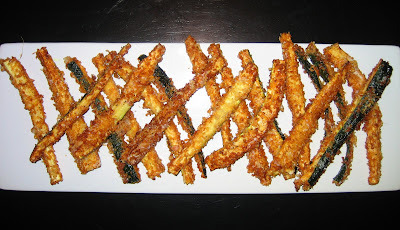 We made some panko chicken the other night and wish we saw these zucchini fries, it would have been a double panko dinner! Lydia's blog send us here and so glad she did. You dishes look great, especially the irish soda bread. Gotta love bread!